Did Anything Survive the Crash? I have always wanted to take a look at an exemplar of the bestselling science fiction novel from each year since 1950, and take each one’s current temperature to see if there are any measurable quality trends. It is hard to do. Aside from the historic New York Times general fiction lists, it is remarkably difficult to track down something as seemingly straightforward as a top-selling science fiction book for each year. Of course, bestseller lists are notoriously off the mark (simply due to the decentralized accounting of books sold, and the tight lips of publishers), but even they tend to keep their own secrets. I preselected a single book from each year that I know sold reasonably well in its day. I tried to do this without regard for my bias in favor or against it (if I have read it at all) by drawing my choices from a number of pre-selected lists. You may be surprised by what turned up. For example, for the 1950s, I took a gander at the American Science Fiction Classic Novels of the 1950s For general guidance, particularly the decades of the 1970s through 1980s, James Wallace Harris’ site was invaluable. Daniel Immerwahr’s Books of the Century helped me to fill in a few significant gaps, as well. Basically, I tried to fairly pre-select a decent list of a top-selling (perhaps in some cases the highest selling) science fiction, with a representative from each year between 1948 and 2010. Then, and only then…I cross-checked those books’ reader reviews at Amazon. Now, I weighted my choices slightly. For example, in 1969, I had to choose (among hundreds) between Ubik, Vonnegut’s Slaughterhouse Five, and Ursula LeGuin’s Left Hand of Darkness. I chose LeGuin as the representative out of those three, even though Vonnegut was the better seller for that year, and Ubik was a better story than the other two. Left Hand of Darkness, however, was definitely a top-seller and also more stereotypically represents popular science fiction in the paperback market of that year. ’69 was a tough call, but no where near the most difficult. Dying Earth, Martian Chronicles, and I, Robot all came out in the same year. Which one would you pick to represent that year’s popular books? Ultimately, it didn’t matter. After all, I was just trying to select a reasonable example from that year though it became decidedly obvious that some years were simply more abundant than others. Award-winning (or at least nominated) books make up a good sampling of my selections, but not always. If I did not recognize a book (or at the very least the name of the author), it was eliminated, even if it had won an award. I tried, very inartfully, to identify a representative book from the era that has a chance of still having even a modest fanbase today. I ended in 2010, because I think the last five years might produce more heat than light. Has there been a discernable trend in the quality of award-eligible science fiction over the years? Has traditional publishing been able to improve on its art form? 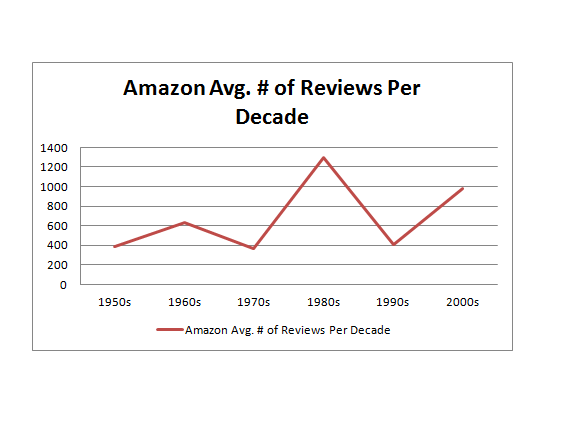 Science fiction from the 1980s (at least from this survey) actually has more average reviews at Amazon than the decade following Amazon’s launch. 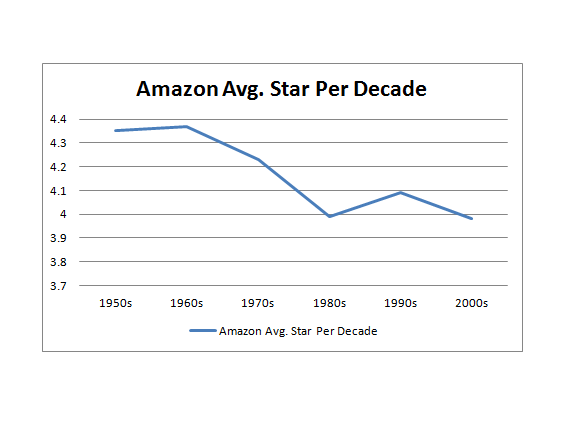 What this chart argues is that science fiction of the 50s and 60s averages better than a 4.3 rating at Amazon (and you’ll note that all decades average more than 350 reviews per book, so small groups of rabid reviewers really don’t factor in). The quality slides in the 1970s, plummets in the 80s, recovers slightly in the 1990s, but falls back below 4 throughout the 2000s. I am providing the raw data here for anyone who would like to dig up more sophisticated insights. I honestly didn’t know what I would find, but I didn’t expect that the selected books of the 1980s would have attracted such a high number of reviews, nor that the “stodgy” older stuff would hold up so well in comparison to the public’s taste for the new. That’s fascinating. I grew up reading classic sci fi and ignored new works that were coming out until the last 15 yrs, so there is a gap in the 80s and 90s of books I haven’t bothered with. Great work. But how did you come up with Tooth and Claw for 2004? Or Ysabel for 2008? And no GRR Martin? Good question. Those two came off of a Best of the Decade list, so I figured they sold reasonably well at the time. No Martin for the same reason as no Rowling: trying to avoid unique contempory multi-media mega-empire effects. I agree with the below comment – a comparison of the ten actual bestsellers of each year would provide an extremely valuable metric. Go for it! I’ll do the 30s through 50s. Start with the Goodreads list to get the 10 highest-ranked books by year, then use lookup the Amazon reviews and stars. It seems to me that a more comprehensive study might provide more reliable results. For example, if one were to use the top 10-selling SF/F novels per year. That should be possible; perhaps the work could be divvied up by decade. * Nostalgia inflates the ratings of the older works. * The reviewer demographic is a bunch of old farts that are necessarily going to like older stuff better. * There was certainly plenty of crap in the old days. The problem is that we compare classic works that have stood the test of time to random stuff on the shelves today. It’s not a fair comparison. * The older genres like weird, science fantasy, and sword and sorcery are all gone because nobody wanted to buy them. You can’t blame the publishers for putting out watered down Tolkien rip-off trilogies. * The older stuff is just of its time. The new stuff is just how things are done now. Tastes have changed. Values have changed. * Pay no attention to the man behind the curtain. I welcome any and all objections. I think the most interesting thing is to compare stuff from within its own era. I would not have guessed that Left Hand of Darkness is one of the least regarded novels of the collection from the 1960s, along with the Man in the High Castle and Stranger in a Strange Land. Considering how much love they get in the circles of the elite, it was simply notable. There’s no objecting to that argument. Or look at some of the Nebula winners from the 2000s. An undeniable number of mediocre reviews. Tooth and Claw would not win the People’s Choice Award. It wouldn’t even be in the running. I did this more for the nuggets like that than to worry about whether or not some fan wants to defend an era. There was certainly plenty of crap in the old days. The problem is that we compare classic works that have stood the test of time to random stuff on the shelves today. It’s not a fair comparison. Yes, this will be an objection but Daniel has insulated himself against it by only comparing the best (or at least his best guess as to the best) of each year. So he’s not just comparing the classics with random crap off the shelf. But it’s a relevant point to keep in mind. I wonder how much of it is due to the need to sell older books as well. You don’t have to fight as hard to get people to pick up, say, The Expanse books (which I love) as you do the Lensmen books or the Null-A books (which I also love). I’m far more likely to hop on Amazon and give Second Stage Lensmen a shining review than I am Abaddon’s Gate, even though I think Abaddon’s Gate is a rockin’ good space opera, simply because it doesn’t seem to be necessary. So I have to wonder if older works are drawing more positive reviews from people who want to spread the word and newer works draw more negative reviews simply because now’s the time to form a public opinion about them. Well, this week I’m going to come out with a little bit of evidence that your theory may not be correct: that in fact, at least some groups of reviewers tend to overvalue the current crop vs. what buyers do…for the exact same books. I also didn’t buy much “mainstream” sci-fi from the mid-80s until the mid-200s, sticking to mil-sci-fi and alternate history stuff including Drake, Flint, Weber, Forschen, Turtledove, and even Stirling (despite his lefty social agenda and, perversely, his obvious fascination with and glorification of fascist cultures, a pretty good military sci-fi writer). It’s only with the new wave of indies and the copycat traditional authors/publishers trying to follow suit (Campbell, et al) that I’ve begun to feel the genre is reviving. I don’t mean to set a table, but that is what I see, too. I just have a sense that my intuition and experience that the genre slowly fell apart, first with minor events like academic New Wave, and then a general malaise. There have always been individual standout books, but I have long believed that the previous generation of science fiction was something of a lost one, an that there is a new one underway that’s overall much more exciting. It’s only with the new wave of indies and the copycat traditional authors/publishers trying to follow suit (Campbell, et al) that I’ve begun to feel the genre is reviving. “The Martian” is an excellent example. It was a self-published book that became so popular so fast publishers took notice and one snapped it up in short order. A textbook case of the publisher providing a product that the reading public already showed they wanted to read. It’s interesting. My gut feeling is that you would see a similar star-rating curve for movies if you could somehow separate technical quality (which has steadily increased) from narrative quality. A peak in the 50’s, a gradual decline during the early 60’s, a sharp decline in the late 60’s and early 70’s, a recovery from the late 70’s through early 90’s, then an utter collapse since the mid-90’s. Frankly US politics trace the same basic shape too. The inflection points shift a few years here and there, but the pattern is the same. Good to see someone else working with stats! You missed 1987 in your data; that would almost certainly be Speaker for the Dead (with a 4.3 ranking), and that would smooth out the 80s dip. Yes, indeed I did! Considering that 4.3 was on the low end of the spectrum for the 60s, yes, it might bump up the 80s to put a little distance between it and the 00s, but that would still place it on the lower side of the 60s. Finally, I myself would not consider these “stats” as much as objective quality samples. In other words, if the comprehensive list tells a different story, I’ll still stand by the evidence above as far as it currently goes. Which is, admittedly, not terribly far! Shameless plug: outside North America a lot of these titles are available from Gollancz, mostly in its SF Masterworks list –http://en.wikipedia.org/wiki/SF_Masterworks– but in some cases in its companion Fantasy list, and in still others, only as ebooks. By my count, 6 from the 1950s, 8 from the 1960s, 10 from the 1970s. Fewer more recent titles for a variety of reasons. Excellent – but note also there is a similar trend in movie ratings over time. There are just SO MANY “classics” that make it onto the top-100 lists (etc. ), yet when I dig into the movies before say 1955 … very few of the high-rated classics would I even view as good. Oh, they’re all black-and-white, with stilted-dialog and very “classic” in that sort of sense, but good? I’m sure if they had Amazon “stars”, they’d have quite a cult following. And newer movies get lower ratings. Until they too … become classics. I suspect a similar bias in the Amazon Stars of older SciFi classics. You might suspect that, but it doesn’t hold up under scrutiny. After all, this year’s initial Hugo nominees are the highest rated in history and compare favorably to classics. No, there was a measurable turning away from popular quality work toward niche “proper” books, an agenda shared by the apparently suicidal publishers and the cliquish and self described “trufans” that favored mediocrity.